Photographs of 1963, showing the hoarding screening Nos. 3 to 8, then only recently empty. Four years later they still stand with gaping holes in the roofs. They are part of a suggested redevelopment involving 3-13, and doubtless offices will be built here. Waterloo Place was built from 1818-1820. 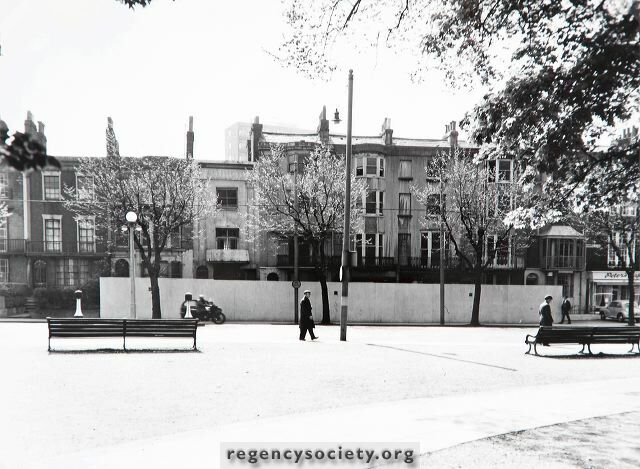 At No.11 Charles Augustus Busby, Architect of Brunswick Square and Terrace, lived from 1822 until 1830. Named from the Battle of Waterloo – 1815.